Her writing portrays her wisdom and insight while it is clear that she is also extremely honest and very relatable to people in many different life situations. In the last chapter on sleep, she writes, "When I turn on Hulu late at night I don't consciously think, 'I value this episode of Parks and Rec more than my family, prayer, and my own body.' But my habits reveal and shape what I love and what I value, whether I care to admit it or not." This is the kind of writing that is found throughout the book - so real to our modern life but challenging to the way we should be looking at each situation. Like any book or person, I don't 100% agree with all of her beliefs and so I'm not endorsing in a "Go think and do everything like her" way but I am endorsing it in a "This is really great stuff that will hopefully change the way you think about things" way. I underlined and drew stars in lots of different places throughout my copy. 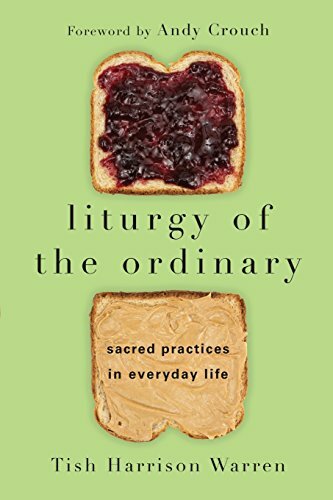 Liturgy of the Ordinary is broken down into chapters that reflect on an aspect of a liturgical church service (most of which we have in a Presbyterian service like confession and communion and some we don't like when she writes about having incense during the service). She ties those to an aspect of our ordinary daily life (some chapter titles are "Brusing Teeth", "Losing Keys", "Fighting with My Husband" and "Sleeping"). In this way, throughout the book, the author is pointing out ways that our mundane moments point us to God. It isn't the mountain top experiences that mold our lives, but rather the moments that make up our days. "We grow in holiness in the honing of our specific vocation. We can't be holy in the abstract. Instead we become a holy blacksmith or a holy mother or a holy physician or a holy systems analyst. We seek God in and through our particular vocation and place in life." (Page 94, emphasis mine). Continuing, "Part of my sanctification...is for me to learn to do my work well - or at least better than I currently do it." (Page 97). Over on the far left, you can see David sitting because at 4 years old, he gets "out" in dodgeball a lot... this time he's frantically waving and screams in his loudest voice, "I love you mom!" I pretty much started crying! It's been a rough day in my house but I'm so very thankful for these little ones God has given me! It's not an easy job, but it is the one that God gave me for my sanctification! It is really hard work being a mom. Let's be honest, it's hard work being a human (remember that post where I said "you (usually) have no idea what people are really dealing with"?). 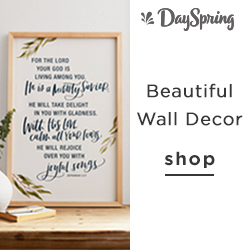 Whatever you are facing today, remember that your opportunities, challenges, struggles, disappointments, spilled glasses of milk, and tears can be occasions for God to make you more like Christ. This book helped me look at more parts (and the general rhythm) of my day through that light and with that goal.